Managing Director, Charles Moir said, “With each new release we're making Web Designer not just more powerful, but even easier to use." 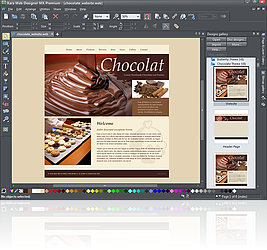 Xara today released version 8 of its popular Web Designer software. Xara Web Designer MX (v8) together with a more advanced version Xara Web Designer MX Premium (v8) combine the advantages of customizable design templates and free-form, anything-anywhere web page design with flexible and innovative options for creating modern, multimedia websites. It offers unlimited possibilities for text layout, graphic design, image optimization and publishing, all in one easy-to-use program. All aspects of the design can be customized. Users can re-arrange all page elements, add their own text, graphics and photos anywhere on the page. It's genuinely WYSIWYG, what you see in Xara Web Designer MX is exactly what you get on the web page. Xara Web Designer MX provides fast single-click re-coloring of all graphical elements throughout the entire website and uniquely amongst all web authoring tools there’s advanced text wrap around irregular shaped graphics and photos. The Designs Gallery includes a collection of widgets to add more dynamic functionality to the website. Site upload is covered too and there's even a free web hosting offer from MAGIX Online World! The MX stands for Media Exchange whereby Xara Web Designer can exchange any graphic or photo with any other installed MAGIX MX application such as MAGIX Movie Edit Pro MX and MAGIX Online Albums as well as Flickr and Facebook. Xara Web Designer MX offers a host of additional exciting new and innovative features that enable both novice and professional web designers to quickly create and optimise content for greater impact on the web. Both versions include enhancements that make it even easier to create a website in Xara Web Designer. A new text styles feature that offers an efficient and powerful way of controlling the global appearance of text. Design your own named styles, and a single edit can update all text throughout your website. Generates CSS compatible styles. Automatic object positioning and page resize ensures that all of your content is adjusted to fit neatly on the page when you add new content. New inline graphics for embedding symbols and icons into text. Improved display on mobile devices such as smartphones and tablets, such as smoother transitions and fade effects on iOS. Many improvements and additions such as in-document pop up link checker, resizable color editor, reposition or re-order multiple pages together, fast optimise all images on the page, photo enhance the hue, new key shortcuts, new widgets and many more. Embedded fonts – website creators can now use just about any font (assuming the font allows website embedding) and Xara Web Designer will create the special font and script required and automatically upload it to the website. New photo transition and improved slideshow Widgets. These no-Flash Widgets are compatible with all modern browsers including phones and tablets. Create numbered lists and graphical bullet points - using Xara's vector graphics capabilities you can now design your own graphics for use in numbered and bulleted lists. Many other improvements and additions such as a Live effects tool that introduces support for PhotoShop Plugins (and a bundle of over 30 plugins), support for SVG, OpenOffice Impress (.odp) and PowerPoint (.pptx) imports and updated camera RAW import. Xara Web Designer MX (v8) operates on Windows XP, Vista and 7 and requires 500MB of RAM and 600MB hard-disk space. Xara has been developing cutting edge software in the UK since 1981 making it one of the very earliest European software houses. Xara has developed a wide range of products covering the whole realm of publishing and graphics software. Xara Designer remains the world's fastest, and many believe, the world's best drawing and illustration software. Xara has a particularly strong technology and innovation history. It pioneered many of the graphics technologies and techniques now standard in the industry today such as anti-aliased vector graphics, vector transparency, object feathering, etc. Many of its user interface techniques have been adopted by the industry. MAGIX is a leading international provider of high-quality software, online services and digital contents for multimedia communications. Since 1993, MAGIX has been developing leading technologies for creation, editing, management and presentation of photos and graphics, videos and music. Internationally, MAGIX operates from branches in the USA, Canada, the UK, Germany, France, Italy, Spain and the Netherlands. The product range is targeted towards laymen and professionals alike and goes beyond the PC range to include seamlessly integrated online and mobile applications. According to its retail sales figures, MAGIX leads in the multimedia software sector in the most important European markets, and is one of the most successful competitors in the USA. Fifteen years of market presence as well as one thousand awards worldwide testify to the company's power of innovation. MX stands for Media-X-change - the idea being based around simplified media and data exchange within Xara and MAGIX programs and services. In time to come, all products of the MX Series will be able to exchange data between each other – directly from the application – and will strengthen the interaction with Cloud services, mobile devices and social networks.